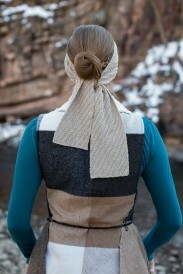 Hold your hair back on the trail, the beach, or at summer music festivals with the Figure 8 Head Scarf. 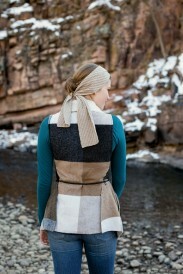 It’s reversible, and the twist can be worn centered or off to one side. Finished Size 4¼” wide and 46″ long. Yarn Lotus Yarns Autumn Wind (90% cotton, 10% cashmere; 175 yd [160 m]/1¾ oz [50 g]): #06 sand, 2 balls. Yarn distributed by Trendsetter Yarns. Needles Size 6 (4 mm). Adjust needle size if necessary to obtain the correct gauge. Notions Stitch holders; tapestry needle. Gauge 30 sts and 28 rows = 4″ in charted patt.